This landscape painting of a charming porch seems to welcome you to sit in one of the wicker chairs and take in this tranquil view of the bay. 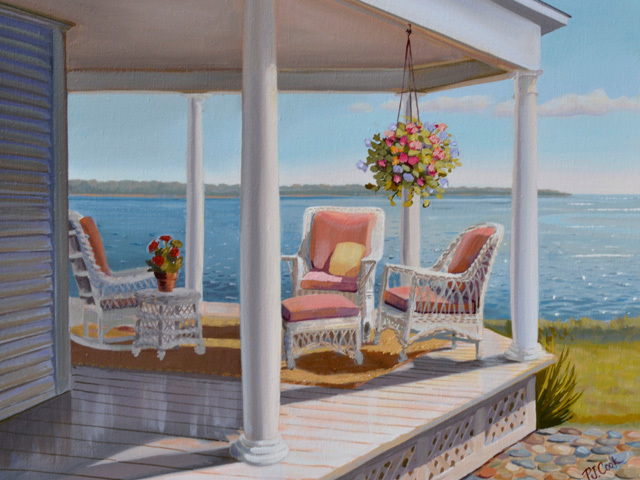 When I came across this porch that sits on Niantic Bay in Connecticut I wanted to paint this peaceful place. The wicker chairs seem to welcome you to relax and renew. The Niantic bay area is a nice place to visit during the summer. There is the mile long boardwalk that follows the beach. Next to the Niantic Boardwalk is McCook’s Park that has fine views of the bay along with benches and picnic tables. For more information about visiting Niantic click on this link discovereastlyme.com. As one can see from previous posts I’ve had quite a painting journey of this porch scene. Since the previous post on July 11th of this charming landscape oil painting I basically worked on the final details. The wicker chairs had fine detail along with the flowers and the planking on the floor seemed to pull this painting together. Painting architectural details can be time consuming but I enjoy working on all the angles and refining the perspective drawing of a scene. I’ve kept the focal point in this painting the lightest value area so it commands attention. I have come a long way as I conclude this landscape painting. I’m pleased with the outcome, and I think this painting displays the mood I wanted to share.